The Gwinnett Chamber and the City of Sugar Hill have recently announced a partnership that will provide new business resources to the community. In an effort to enable its small business resource efforts to be more accessible to the business community, the Chamber will begin to facilitate some from the Suite Spot, a business incubator in downtown Sugar Hill. The Chamber plans to host bi-monthly consultations, monthly workshops and group discussions with business owners, mentors and local entrepreneurs at the Sugar Hill location. This educational resource is the perfect complement to the tools already offered by the Suite Spot. The business incubator is currently home to SCORE, which is a network of entrepreneurial mentors, and SBDC, the University Of Georgia’s Small Business Development Center. 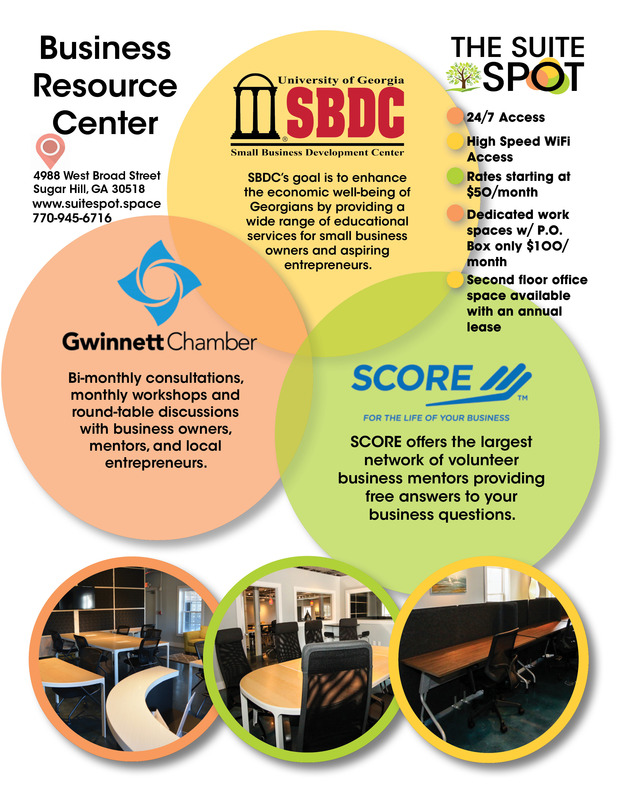 All of these resources, including the community connection partnership with the Gwinnett Chamber of Commerce are available free-of-charge at the facility. The Suite Spot boasts several dedicated work spaces, available with a PO Box for only $100 per month as well as private office space for lease and a co-work space with 24-hour access and high speed WiFi for only $50 per month. This partnership between the Chamber and the city will strengthen the relationship with local business owners, the city and the Gwinnett Chamber, thus fortifying economic development in the area. For information on the program, please contact Scott Andrews at sandrews@cityofsugarhill.com.